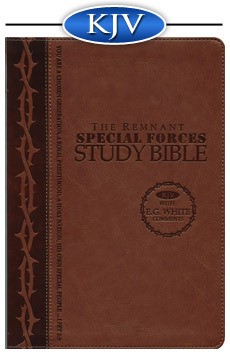 This Bible is the Brown Special Forces Edition. Many study Bibles are available today. The new Remnant Study Bible, however, is unique in ways that set it apart from all others. This Bible combines special comments by E. G. White with the text of the King James Version. In addition, this Bible is replete with a full array of Bible study aids, including a complete set of Chain Reference Bible Studies, a section on Prophetic Symbols, and sections on the prophecies of Daniel and on the Bible’s teaching about the Sanctuary. An additonal £10.00 International Shipping charge for this product. Please contact us for details. This Bible not only looks good but has all the elements to help make studying and reading the bible easier. The guides in the back of the bible and Ellen G White notes through out are an excellent addition making the purchase of the bible worth every penny. I highly recommend getting one for yourself and your friends, especially young people. What's there not to like about this KJV bible? Friendly service and quick delivery was a plus. The origional glossy boxing is top quality with all the special features highlighted at the back. The bible itself has a premium soft leather feel to it and an excellent design with the thorns' symbol reminding us of Christ's sacrifice. The brown leather and gold coated edges of its pages are visually impressive. The study guides inside, chain references linking themes across the bible and Ellen White comments make this a very special bible for those who have a hunger and thirst for God's word in these last days of earth'e history. Worth every penny!